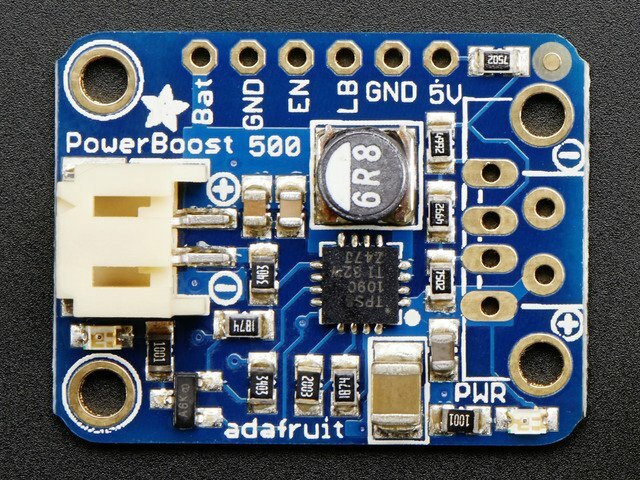 PowerBoost is the perfect power supply for your portable project! This little DC/DC boost converter module can run from 1.8V batteries or higher, and convert that voltage to 5.2V DC for running your 5V projects. Like our popular 5V 1A USB wall adapter, we tweaked the output to be 5.2V instead of a straight-up 5.0V so that there s a little bit of headroom long cables, high draw, the addition of a diode on the output if you wish, etc. The 5.2V is safe for all 5V-powered electronics like Arduino, Raspberry Pi, or Beagle Bone while preventing icky brown-outs during high current draw because of USB cable resistance. On-board 500mA charge-rate Apple/iOS data resistors. Solder in the included USB connector and you can plug in any iPhone or iPod for 500mA charge rate. Not suggested for iPad (which really needs 1A charge rate). Great for powering your robot, Arduino project, single-board-computer such as Raspberry Pi or BeagleBone! Each order comes with one fully assembled and tested PCB and a loose USB A jack. If you are powering your project from USB, solder the USB A jack in (a 3-minute soldering task). If you would like to use a terminal block, pick up a 3.5mm 2pin block here and solder to the output spot where the USB jack would go. Or don t solder anything in for a more compact power pack.